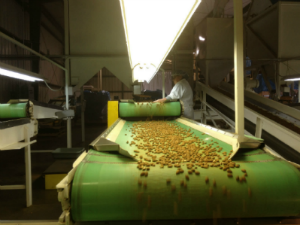 We only market almonds grown ourselves from our own orchards. Packaging is typically in 50 lb cartons or metric ton (2200 lb) fiber bins for wholesale purposes. Retail products are available at our storefront at 10218 Lander Avenue in Turlock, CA. A large, light brown variety, Nonpareils are very versatile. They are easily blanched (skin removed) and cut when processing is wanted, allowing the end product to remain blemish-free. California varieties are used primarily in manufactured products. They are well sited for nearly any utilization due to the wide range of characteristics within this variety. A member of the California variety, Carmel is very popular and is often a substitute for Nonpareil or other California types. They are easily processed and often used for blanching and roasting. The Sweetheart variety was developed by the University of California as an alternative to the Spanish Marcona variety. The Sweetheart almond has a distinct heart shape and excellent flavor due to the high quality oils in the kernel, making it excellent for roasting. Almonds are one of the most nutrient rich tree nuts on Earth, containing vitamin E, magnesium, manganese, fiber, copper, phosphorous, and riboflavin. When comparing almonds to other tree nuts, almonds are highest in protein, fiber, calcium, vitamin E, and niacin. 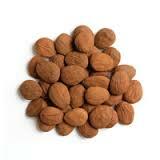 The vitamin E in almonds is alpha-tocopherol vitamin E, which works to neutralize free radicals. On top of all of this nutrient density almonds do not contain any cholesterol, which makes them a good option for a heart-healthy snack.